Finishing is the last step of the apparel industry. Quality Control is necessary for every stage of garments production for the purpose of making a quality product, finishing the garments, prepare for shipment and finally deliver to the garments buyer. So, finishing is a very important process in garments. To ensure finishing quality control by the garments manufacturer a finishing quality control SOP of Apparel Industry is to prepared and followed accordingly. Here SOP means Standard Operating Procedure. Ultimate quality control, garments decoration, and ticketing are done in the finishing process of the apparel industry. 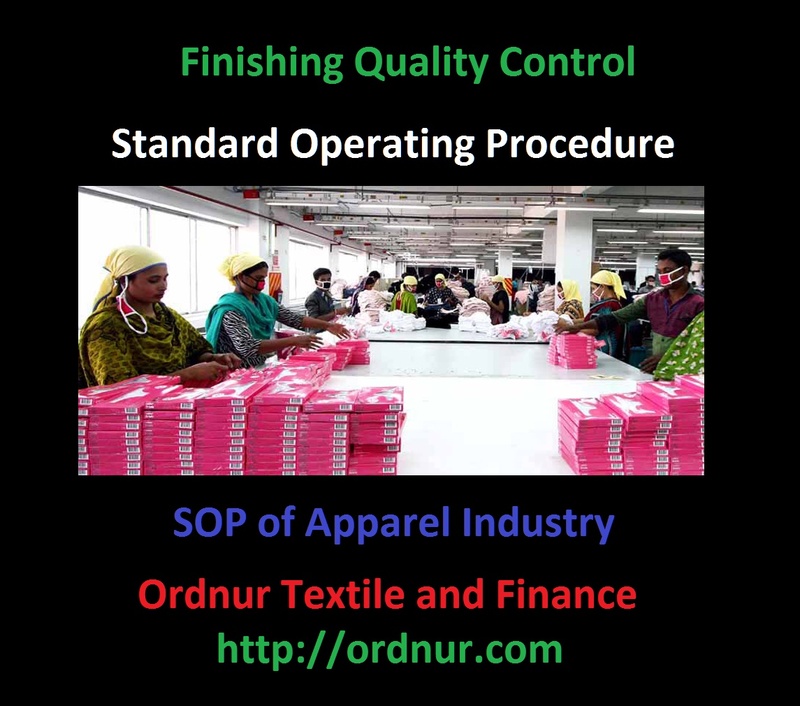 For finishing quality control following standard operating procedure can be followed for the apparel industry. All Sewn Garments is to receive into finishing section after washing (if GMTS need finishing as per buyer’s requirement). Washed garments to be checked for shade acceptance in a standard lightbox as per buyer approved all shade standard. If a lot fails in AQL to meet shade acceptance, then GMTS will send back to washing for rewash. After passing shade of Garments and thread trimming, quality checking starts as per style wise process sequence but must maintain size wise bundle. Excessive WIP (Work in Process) and dumping more than one bundle stacking in one layer is not allowed in any operation of finishing. Any defective garments will not pass from any operation without alteration and QC pass. Specific written instruction for every operation with garments form mockup as visual instruction for ironing, attaching the sticker, measurement, quality inspection, folding and packing. Approve trim card for every style with all finishing trims and accessories. 100 % garments metal detection is to follow to ensure garments free from a needle, sharp tools and any types of metal as ensured product quality. Packing of garments as per customer Stock Keeping Unit (SKU) and assortment requirement. Garments come in iron table size wise by the bundle. Only one size is allowed in a bundle. Iron table marking before every style starting. A carton in every iron table to keep defects and marking with arrow sticker to detect defects. Out of tolerance Garments not be passed from measurement section, the Iron show having every measurement table. Every Gate up Quality inspector having measurement tape and style wise measurement sheet. Approved sample hanging with written instruction in Iron, Quality Inspection, and packing area. From Iron garments moving bundle wise up to packing. Garments not are gathered by more than one style or color in every iron and quality inspection table. Finishing AQL Auditors audit GMTS before moving GMTS to packing area from every bundle using AQL 2.5. If audit pass, GMTS will move forward for packing. If Audit fails, an auditor will give back GMTS to Quality checkpoint area to recheck. After completing recheck, AQL Auditor will re-audit. An auditor audit full PO lot as per buyer final audit sampling policy when that PO is already 80% packed to check packed GMTS quality before a final audit. If Pre-final audit fails, then full PO will be rechecked. Tagged Finishing Quality Audit, Finishing Quality Control SOP, Finishing Quality Control SOP in Apparel Industry, Finishing Quality Control SOP of Apparel Industry, Finishing Quality Control Standard Operating Procedure, Ironing (Pressing) Standard Operating Procedure (SOP) in Garments Finishing, SOP of Finishing Section, SOP of Garments Finishing Section.